This unit is a bit of a milestone, the final unit of French légére I shall be painting. My French Napoleonic forces are near completion and this is my 10th battalion of légére, joining 4 battalions of the 1éme, 3 battalions of the 2éme and the other 2 battalions of the 13éme. Three battalions of ligne and 3 battalions of garde left to do, but another day maybe. That will bring me up to 28 battalions of French infantry, a robust force indeed. This battalion has a bit of an unusual provenance, I bought these Front Rank figures from a very well known rules writer 3 or 4 months ago and they languished on the table. If I remember correctly he had purchased them without realizing that they were pre-Bardin. They were a bit odd as they had been primed with AP Blue primer, I was curious about this as the uniform of the légére of course is all blue, so it should make them a little easier to paint. There was some difficulties though as the primer does not have much bite and my style of painting requires a primer which has some adhesion. I found that if I drybrushed them with GW Enchanted Blue and then washed them with GW Asmuren Blue wash they looked pretty good. I like a nice bright blue on my French, while going with a greyer blue on my Prussians. A great Flagdude standard decorates the force and I include a photo of the whole regiment. Quite a varied regiment as you can see, this is the only battalion where the carabiniers are wearing bearskins, but at the same time my other two battalions have their voltigeurs sporting colpacks. Anyway Front Rank has great looking pre 1812 French and I am quite happy I have finally completed this regiment. I think these were my 4th submission to the Analogue Hobbies painting contest. I have been puttering along, just finishing my submission due for the fortnight's bonus competition this coming Saturday. I also have some WWII on the table that is almost finished. Unfortunately, I do not believe that I will meet my goal this year........ c'est la vie! But I will try. 28 battalions - that would, indeed, be a sight on any tabletop! I do love the look of the Legere uniforms, and these came out great. Lovely work... I think for the color alone, these will leave my 95th rifles with no chance at all! These large units look magnificent with their gorgeous plumes! Great paintjob for a great unit! That's some great work John! 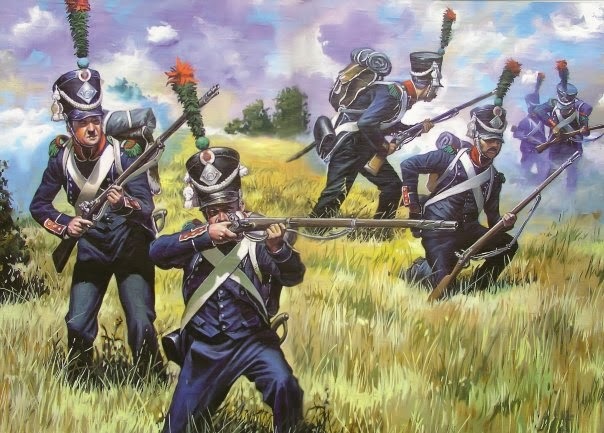 I love my Napoleonics colourful and those guys certainly fit the bill! Magnifique John! I love the Legere, particularly in the fully plumed pre-Bardin uniforms! 28 battalions -phew! That's crazy - but I bet they look fantastic on masse on the table. Congratulations on your fine work.